To see a flip version of the book, visit here. The second book in Tim McGraw’s My Little Girl series is a heartwarming story of a little girl’s selfless act of kindness. 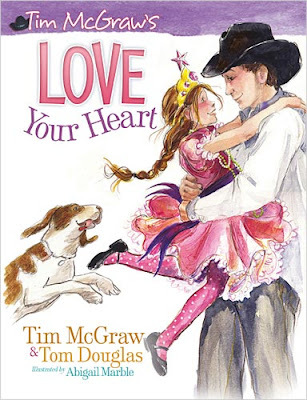 Tim McGraw and songwriter Tom Douglas once again join forces to write another book about the precocious Katie and her dad. Katie has many talents, but she wonders which one will win her school’s talent show. With the help of Dad and her faithful dog Palio, and after several amusing mishaps, Katie finally chooses one talent that includes Palio. But at the talent show, she decides to drop out of the contest to help her friend, showing kindness is the best talent of all. Katie’s proud dad reassures her that she did the best thing and that while he loves many things about her, he loves her heart most of all. Tim McGraw is a dad of three daughters, husband to Faith Hill, Country music superstar, Grammy Winner, American Music Award Winner, Peopleâ€™s Choice Winner, highest grossing tour in history (with wife, Faith Hill), and has sold more than 35 million albums. Yet, beneath all the accolades beats the heart of a dad who immensely loves his family. Tom Douglas is a singer-songwriter who graduated from Oglethorpe University and received an MBA from Georgia State University. He is the writer of hits “Little Rock” by Collin Raye, “The Gift” by Jim Brickman, “Love’s the Only House” by Martina McBride, and “Grown Men Don’t Cry” by Tim McGraw. He and his wife have three children. Disclosure: Mama Buzz and reviewers received a complimentary copy of this book for review purposes. I was choosen to review a book written by THE Tim McGraw, Love Your Heart. This story is about a little girlm Katie who has to find a talent for her school's talent show. But what should she choose? Katie thinks she's very talented and wants to try all sorts of thing, but after some mishaps while showing her daddy her talents she and her dog Palio think of something they can do together. Once at the talent show, things take a different turn that will show a selfless act of kindness Katie has. Katie's Dad was so proud of her for what she did, that no matter what talent she has, he loves her heart most of all! I knew this would be a book my 6 year old daughter would love, so I was excited for it to arrive. We read daily for homework so a new story was great to have. We actually read it a few times since, and she has taken the book to go sit and try to read herself too, she really enjoyed it, as did our 2 yr old son. The font is easy to read and the pictures are just lovely, fun, colorful and puts you in the story. This is a nice hardback book with large pages making it easy for little ones to sit around you to see. I recommend this book for all children, as it teaches the act of kindess from your heart. It's a story that will be enjoyed every time it is read. Thank you for MamaBuzz, the publisher and Tim Mc Graw for allowing us to read your delightful story. You can find my review posted at Amazon as well. I wrote this review for "Mommy? I'm Hungry!" about Love Your Heart. I received free product for this review. All opinions for this review are that of myself & family.